The complex MAROLA - Portosin is family friendly and has been refurbished in 2007, has 4 floors, 24 hour reception and internet access (fees apply). The complex is ideally situated 500m from the center of Playa de las Americas. 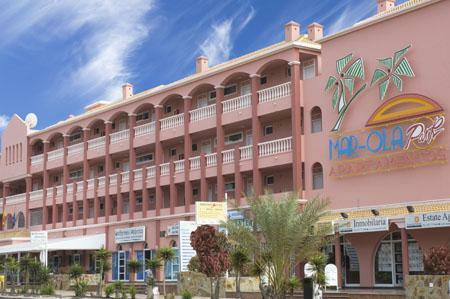 It is 650m from the beach and 1.2 km from Los Cristianos, near a large number of bars, restaurants and shops. Tenerife South Airport is around 16 km away, while Tenerife North Airport is approximately 90 km away. Enjoy the inviting terrace with 2 swimming pools (heated in winter) with children's area, poolside snack bar, sun loungers and parasols. You can also play billiards, table tennis and bocce. The comfortable studios offer a living room with sofa bed and bedroom, full bathroom, kitchenette with fridge and balcony. With an extra charge you can make use of safe, telephone and TV.